The Museum of Science and Industry's new exhibit "The Art of the Bicycle" shows off the full range of the bicycle's history, from antique German "walking machines" to the cutting-edge cycles we'll all be riding ten years from now. You've got some time to check it out—the exhibit is open through 2018. Sanford Biggers's window installation "Ago" has a formal decorativeness that belies its provocative intentions. 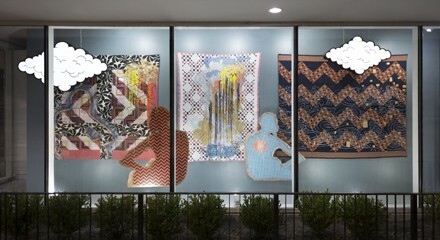 Housed at Monique Meloche Gallery, it combines a number of mediums (fabric, spray paint, wood, light boxes) and cultural references (quilt making, graffiti, Japanese woodblock prints, landscape painting) to put a twist on manifest destiny and America's coded—and not-so-coded—racial histories. "Rio singer-songwriter Marcelo Frota, aka Momo, has made three superb albums of Brazilian folk-rock," writes Peter Margasak in Soundboard. "But his latest album, the self-released Cadafalso, strips his music down to its essence—just voice and acoustic guitar—so that his songs can step out from behind all those stylistic trappings." Momo performs at the Old Town School of Folk Music's Maurer Hall.